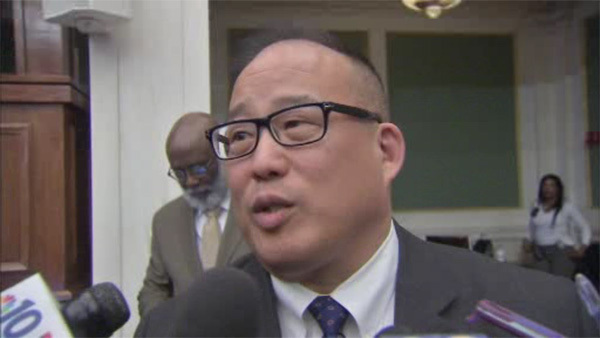 PHILADELPHIA -- Philadelphia City Councilman David Oh is expected to make a full recovery after being stabbed during a robbery attempt outside his home in Southwest Philadelphia, his office said Thursday morning. Oh is hospitalized in critical but stable condition at Penn Presbyterian Medical Center. Councilman Oh is in recovery after a successful surgery overnight. He will remain at the hospital to monitor his recovery but (is) expected to fully heal and return home soon. The Councilman thanks the medical staff, his Council and City colleagues, and the community for their prayers and support, and he looks forward to getting back to City Hall to serve Philadelphia. Additionally, anyone with information about this crime is urged to call 911. The incident happened after 10 p.m. Wednesday on the 5800 block of Thomas Avenue. Police say the councilman-at-large, who has lived in the same neighborhood since the 1960s, was unloading bags from the trunk of his car when a man approached him. The man spoke to Oh, who said he couldn't understand what the man was saying. Oh then asked him several questions. That's when, police say, the man took out a knife, demanded Oh hand over his car keys, then stabbed Oh in the left side of his body and fled. Police believe attempted robbery/stabbing of Councilman David Oh was crime of opportunity, likely the suspect didn't know who he was. Medics rushed the councilman to Penn Presbyterian Medical Center in the city's University City section. Oh underwent emergency surgery overnight, and is now listed in critical but stable condition. Before he went into surgery, authorities say, the councilman was alert and talking. He wanted people to know he is going to be OK.
Fire commish,sheriff,council president, among the well-wishers who came to hospital to check on Councilman Oh, stabbed in attempted robbery. City officials, including the fire commissioner and Philadelphia City Council president, were among the well-wishers who came to hospital to check on Oh early Thursday. Police say the robbery attempt was likely a crime of opportunity. They believe the suspect probably did not know the person he attacked is a city council member. Investigators are canvassing the neighborhood to see if any surveillance cameras captured images that will help them track down Oh's attacker. Oh, a military veteran, has a wife and four children. He was first elected to Philadelphia City Council in 2011, then re-elected in 2015.